I pointed out in January that Renault is poor at giving details of the UK launch date for the Zoe but that the Renault Z.E. 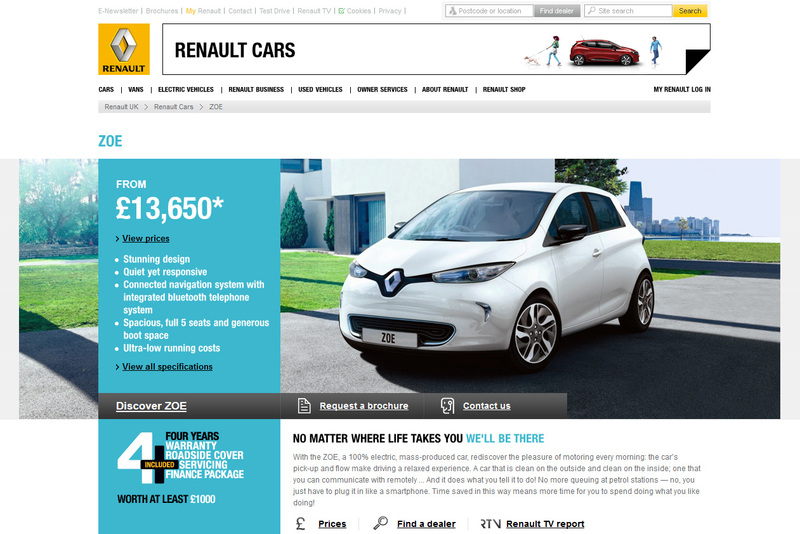 tab on the Renault.co.uk site seems to be the best indicator. It has just been updated again (hat tip to Deejay in the forums). Where it previously said ‘ZOE (SUMMER 2013)’ it now just says ‘ZOE’ – in the same way as all vehicles currently available to buy. More significantly, perhaps, is where the link goes to. Originally it went to a page where you could pre-order a Zoe. Recently the link was changed so it just took you to a page where you could register to receive emails on future models – a bit worrying! Now it takes you to a new set of pages giving pretty comprehensive information on the Zoe, including specs, prices, warranty, battery leasing, etc. Zoe’s regenerative braking works on the accelerator when you lift off – but also (unlike many EVs) on the brake pedal when you push it. 85% of its mass can be recycled; 95% of the vehicle can be reused at the end of its lifecycle, including its batteries; and it includes over 9% recycled plastic. Zoe can text you when it is low on charge, and if you programme a charge it can contact you at the start and when it completes. Maintenance is estimated at 20% less than an ICE car. The heat pump works completely independently of the motor – therefore there is no problem with using the heating while the motor is switched off (obvious, of course, if you think about it). Motoring Pack: Preferential rates to hire an ICE car from Enterprise Rent-A-Car. Full details are available in a PDF. In addition the battery hire agreement guarantees a minimum 75% charge capacity and full recovery services in the event of breakdown. The battery lease prices are the same as previously released; however it is suggested that other options are available from dealers and it is hinted (on the right side of the battery page) that they can be as low as £45 per month (for 4500 miles/year). On the whole this is a very encouraging development and it looks to me like Renault is actively building up to a UK Zoe launch.